Ladies, it’s a Leap Year! 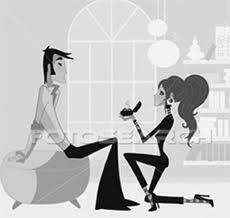 Today, 29th February, is the day when in Britain it is a tradition that women may propose marriage. It is said that this tradition goes way back to the 5th century although there is little evidence to support this. What is definite however is that while in an ordinary year, girls might be happy to wait for the man to do the asking, almost half of unmarried women polled in a recent survey would take advantage of a leap year to propose to their partner on February 29 – though two thirds would still expect their partner to buy them a ring! It also revealed that three quarters of men nationwide would have ‘no problem’ with being proposed to. So come on Ladies, this opportunity will not come your way again for another 4 years – and don’t forget to talk to Party Lights about the lighting hire for your reception! Posted on February 29, 2012, in General, Trivia and tagged 29th February, Leap Year, marriage, Proposal, tradition. Bookmark the permalink. Leave a comment.